Sing her a love song - with flowers. This lush, loving rose arrangement tells her just how much you care. 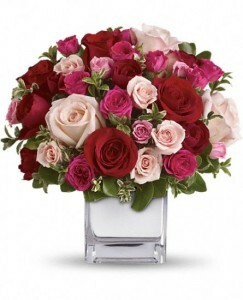 •The stylish bouquet features large red and pink roses accented with smaller spray roses in shades of red and pinks. Delicate green oregonia and pittosporum add a fresh contrast. •The flowers are delivered in our exclusive Mirrored Silver Cube vase. 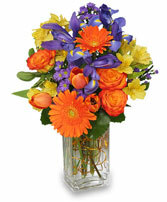 •Approximately 10 1/2" W x 11" H •This item is hand-arranged and delivered by A Royal Bloom florist. 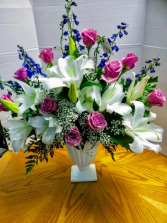 A large pedestal arrangement consisting of Oriental lilies, roses of choice, blue delphiniums and Gyps.